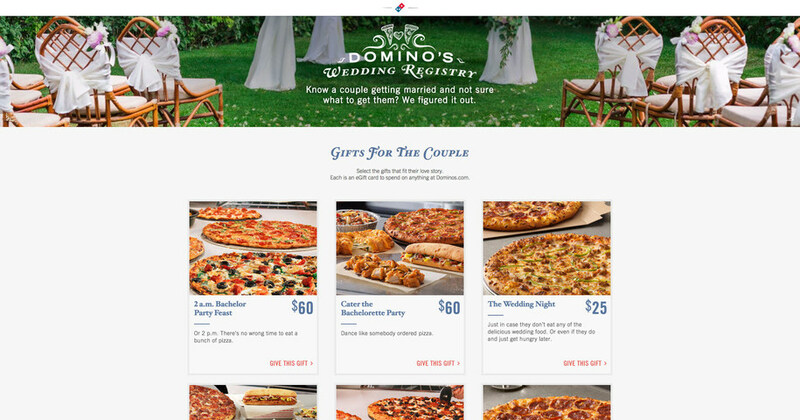 In case you're planning on getting married but would rather have Domino's pizza than other stuff (or maybe you just don't have room for said stuff), Domino's now offers their own online wedding registry at dominosweddingregistry.com. At the very least, it should make for a fairly quick selection process to fill out the registry. After you create/customize your registry, you can choose from options that cover before, during, and after wedding eating occasions, including "Cater the Bachelorette Party," "The Wedding Night," "Thank You Card-a-thon," and "An Excuse Not to Cook." All the gifts come as Domino's eGift cards so you can more or less use them whenever you like. Like similar online wedding registries, the Domino's wedding registry includes easy options to share it via social media and can be searched by using the names and wedding date of the couple in question.